I own a Pebble Steel and I’m really quite fond of it. It keeps me on track by giving me turn by turn directions while I’m out on my motorbike, lets me skip songs while driving without fumbling around with my phone, and it lets me know when people are trying to get hold of me, even if my phone is on charge in another room. It solves some simple problems for me without creating more to take their place. But we all know that hardware is really only ever as good as the software that runs on it and as an ex-developer I often found myself wondering what it would take to write my own app for my new watch. Some very light reading led me to believe that I’d need to know how to program in C. Learning a new language just to play around with watch apps didn’t really seem worthwhile. I just didn’t have that kind of time to invest, so I shelved the idea. Several months later I found myself stuck inside on a particularly rainy Saturday and decided to take another look. I’d committed the day to the exercise assuming I’d probably need to get a special development environment up and running before I could even attempt a basic “Hello world” app. 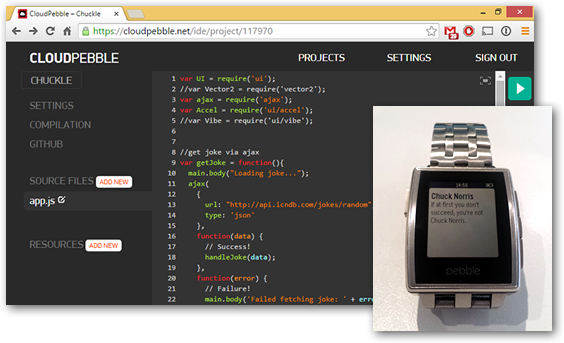 Two hours and 68 lines of code later I had my new app running on my wrist. Sure, the web-based IDE was a bit rough around the edges and not as fully featured as its desktop-based cousins but overall the process felt quite streamlined. Not bad for a service that’s still running under the “beta” banner. Now “Chuckle” isn’t exactly feature rich, or even interesting as anything more than a proof of concept. In fact it only really consists of a splash screen that loads a random Chuck Norris joke when you shake your wrist. But it does load the jokes from publicly accessible API and that last part got me thinking. What else could I hook this app up to? Stay tuned for my thoughts on wearables and web services in my next post. View Previous blog What makes a good customer experience?